This story begins in the middle of 19th century with a young man trailing sheep through the washes and up the gullies into the hidden mountain meadows of the desert west. The young man is Basque, maybe 17 years old, poor, lonely, probably illiterate, and likely knows no language other than Basque, which might as well be no language at all. He’s come to America because euskal herria is no place to be if you’re the second son, destined to inherit nothing of the few stony acres your father inherited from his father. So, traveling to Nevada and spending six months of every year mostly alone, the only company a horse, a pair of blue dogs and 2,000 head of sheep, might seem like a good career move. The Basque countryside near Saint-Etienne de Baïgorry, Basse-Navarre, France; small farms on hillsides carefully tended. The Basque are the original natives of Europe, the remnant of the humans who appeared on the continent as early as 30,000 years ago, before the invention of agriculture and long before the arrival of the Indo-Europeans, those hard-charging warriors who swept out of the Pontic steppe 5,000 years ago, conquering and subsuming all they encountered…except for the Basque. In other words, the Basque, who were as likely to have made it to the present age as the woolly mammoth or the auroch, somehow managed to do just that. That the Basque have maintained their singular language and their unique DNA, despite the Indo-Europeans, and despite the Celts, Romans, Goths, Arabs, French and Spanish who followed, is a testament to the poverty of their homeland and their ferocity in defending it. Present day euskal herria is about the size of New Hampshire and straddles the border of France and Spain, half on one side, half on the other. The Pyrenees aren’t high in the Basque country, less than 6,000 feet at the peaks, but they’re rugged, with no broad river valleys or fertile plains, and thus no great estates of the sort that produce aristocrats. Instead, there were small farmers and craftsmen with a long tradition of hard physical labor and egalitarian independence. And because their rocky land has never provided enough food to feed them, the Basque fished, whaled, soldiered, built boats, traded goods and smelted iron, sending their second sons away from the farm into the wider world. In the twelfth century it was easier for the kings of Castile to bribe the Basque into union than conquer them, and so for centuries whenever a new king succeeded to the throne, he rode northward, stood beneath the Oak of Guernica and pledged to respect the traditional laws of the Basque. And, in 1508, when his Inquisition raged, Ferdinand extended the hidalguía to every Basque, thus making them all hidalgos, free men of purely Christian blood, petty nobles exempt from taxes and owing no service to anyone but the king. By doing this the Basque were thus qualified to serve the crown as priests, officers and officials, and Basque merchants could fill the commercial roles that had formerly been occupied by Jews. 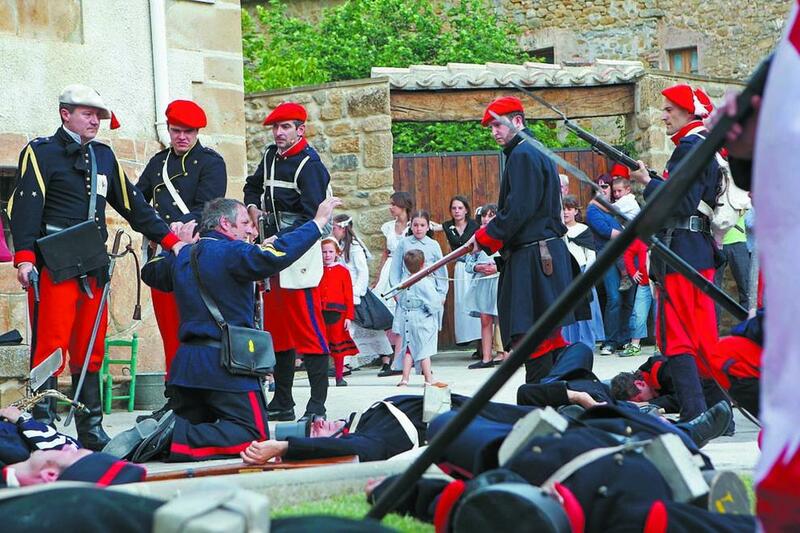 Basque Carlists in red berets take prisoners at end of the the Battle of Lácar, Third Carlist War, 1875. A reenactment from 2012. By the nineteenth century, the decline in the fortunes of Spain and greater global competition had eliminated many of the advantages the Basque had held. Another blow arrived with a series of of civil wars fought between Spanish traditionalists and progressives, known as the Carlist Wars. In Basque country it was rural versus urban; tradition, customary laws and independence versus progress, industry and Hispanization. By the middle of the century, Basque sons were now leaving euskal herria for economic and political reasons. In 1848, the discovery of gold at Sutter’s Mill diverted this stream of emigres northward from Latin America to California, where some of them found they could make money providing wool, leather and meat to the miners in the Sierra Nevada. Others had the same idea, and herds of cattle and sheep filled the state and spilled over the mountains into Nevada and northward into Oregon and Idaho. Because cattle scatter and run, cow herding is difficult, mounted work, something not easily mastered by greenhorns. But sheep bunch, making sheepherding easier to learn. Teenage boys with dogs can do it — get the bellwether moving in the right direction and push the dogs with whistles and shouts, they’ll handle the hard work. The only trick is enduring the loneliness. The young Basque men who started arriving in the middle of the 19th century were dependable, honest and hard-working. They were not, as has often been said, unusually skilled at herding sheep. Few herds in the Basque country would ever reach 2,000 animals. Nor were the Basque particularly suited to enduring the grinding loneliness. Enough of them went mad that there were common terms for it, “sheeped” or “sagebrushed”. Likewise, the deserts of the Basin and Range were nothing like the Basque country, the greenest and wettest part of Iberia. How did Basque sheepherders pass the time? In the mountains, they carved images and words in to aspen trees. These Basque arborglyphs, found wherever sheep and trees came together, date back to the 19th century and record the names and obsessions of the men who carved them. These images were carved by herder Etienne Maizcorene in the 1930s in Humboldt County, Nevada. But, if a sheepherder could endure six months alone in the wild, from lambing to market, not lose too many animals to coyotes, wolves and poisonous plants, he could make a wage better than anything possible in Spain. He could even take his pay in ewes and start his own herd, chasing the sparse grass through the open rangeland in search of his fortune. Many of them made enough with these tramp herds to buy their own ranches before the open range was closed. When they weren’t herding, the Basque sheepherders put up at boarding houses and hotels run by sheepherders who’d saved enough to leave the range and settle down. These hotelkeepers provided every service, from banking to employment agency to secretarial, writing the letters home that would be read to their families by the local priest. They fed the sheepherders boarding house style, on a hearty fare of meat, beans, bread and wine. The key was meat and more meat, lamb, mutton and beef, a wild luxury for a European peasant boy and partial compensation for those long months alone. Basque American food is not the rarefied and inventive cuisine of 21st century Bilbao. The ocean is far away and there are no fish but farmed trout, salmon or shrimp. The Michelin Guide, which provides the Pais Vasco with more starred restaurants per capita than any other region in the world, has never been to Elko. And in Winnemucca the word “molecular” does not refer to something one would wish to see on one’s plate. However, what can be said is that the surviving Basque restaurants, many of which have been in business for more than a century, provide the most authentic, 19th century regional cuisine found in the western United States, part Basque and part chuckwagon, all Western. What’s important from a food history perspective is that Basque boardinghouses continue to serve the same dishes in the same way they did a century ago, family style, starting with the “set-up”, everything but the main course — soup, salad, pasta, potatoes, Basque beans, garlic bread and a half-bottle of harsh red wine— and ending with the meat — beefsteak, lamb chops, pork chops, grilled chicken, or whatever speciality the house is known for. Grilling and stewing are the main techniques and garlic features prominently. In some places, “garlic soup”, a tomato soup with a garlic kick, replaces the more common cabbage soup, also garlicky. And, if you ask for it (and do ask) chopped garlic, briefly sautéed, will be piled high onto your steak, lamb or pork. The set-up at the Star Hotel in Elko, Nevada. At Wool Growers in Los Banos, California, a place I’ve been to so often I’ve got a frequent glutton card, the set-up includes a bowl of lamb stew to tide you over until the meat arrives. In Reno, at Louis Basque Corner, the dishes to ask for are rabbit stew or oxtail bourguignon. At J.T. Basque in Gardinerville, Nevada, it’s pigs feet and tripe. If it’s lunchtime and you’re in Winnemucca, head to the Martin Hotel for the solomo sandwich, pork loin long-simmered in wine with garlic and pimentos. Of course, I have other favorites. The Noriega Hotel in Bakersfield, which has received much attention from the national press, is comprehensively excellent. In Elko it’s a toss-up between the historic Star Hotel and Toki Ona. Pork Chops with garlic at the Star Hotel. One of my all-time favorites, however, is the Basque Norte in Chico, California, 30 miles from where I grew up, an hour-and-a-half north of Sacramento. There they offer a strong picon punch, abundant lamb or steak, and are famous for selling the best commercial meat marinade in the country. My only complaint is that they’re now advertising “Spanish tapas” (instead of “Basque pintxos”) trying with those tiny, trendy dishes to lure in the outsiders who’ve moved to town. Basque hotels are where the locals eat, and in the rural west the locals prefer meat, potatoes, beans and dozen old-fashioned, garlicky side dishes, not tapas. This is why the Basque places seem locked in the past, because the people who eat at them are conservative in every sense of the word, ranchers, farmers, miners and the people who make their living servicing those industries. The Basque sheepherders, despite the barrier of language and religion, fit right in to the culture of the West. After 1876, the Basque most likely to come to America were the losers of the Carlist Wars, the most traditional and conservative elements of Basque society, those who believed in the Church and Basque nationalism, which is why those two institutions flourish in strange, Mormon-sotted places like Idaho. Basque sheepherders continued to arrive in America right up until the 1960s, when Spain finally emerged from the economic funk brought on by the Spanish Civil War and Franco’s tepid support of the Axis during World War II. At that point, trailing sheep no longer seemed a good option, and the work was given over to newer immigrants from Peru and Boliva. By then, most of the Basquos, second and third generation, had moved up the immigrant ladder, and the Basque hotels closed their upstairs rooms. But downstairs, the dining rooms continued to serve their abundant meals, luxurious with meat and garlic, accompanied by bottomless tureens of soup and more beans then they could imagine in one meal back home. P.S. If you’re interested in learning more about Basque boardinghouses, the best book is Home Away from Home: The History of Basque Boardinghouses by Jeromina Echeverria, a meticulous study from the Center for Basque Studies at the University of Nevada, Reno. P.P.S. In the West it’s always been sheepherder, not shepherd. Sheepherders herd large flocks of sheep in open country. Shepherds tend small flocks in closed pastures. At least, that’s what I’ve always been told by the sheepherders I’ve known. Great article. One of my favorite places is not on your list: Leku Ona in Boise. Fantastic lamb chops. Oh man, this is wonderful! I know only the Basque Hotel in San Francisco–but now can’t wait to go to Bakersfield. Any Basque food in Fresno? I may be there soon on a reporting trip. Charlotte, sorry for the late reply, but yes Fresno is good for Basque food too. Santa Fe Basque on Maroa Street, and the Shepherd’s Inn across the street from the train station for the traditional boarding-house setting. Charlotte, Bakersfield has more than one Basque restaurant. Noriega’s is very very good! I would also visit Woolgrowers and Benji’s too. Thanks so much for this edifying article on the Basques in America. I sent it to friends as a teaser for the Smithsonian Folklife Festival 2016 that just ended this past weekend in Washington, D.C. on the National Mall. It featured the Basques prominently, both the diaspora and the Basque still over yonder in Europe. Wonderful people, wonderful music, wonderful food. Did you also happen to see the WSJ feature Basque cuisine in its pages some months ago? I thank you for introducing me to this enduring and innovative culture.